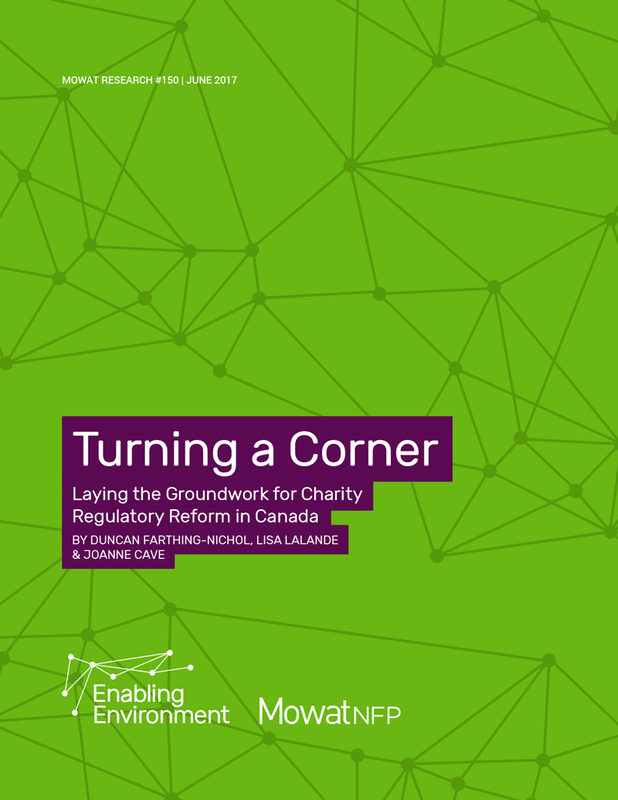 Mowat NFP’s new release, the second in its Enabling Environment series, aims to set the stage for the design of a new legislative framework governing the charitable sector in Canada. Canada’s charitable sector is at a crossroads. Heavy demand for services is already straining capacity. If, as seems likely, charities face a future of slow revenue growth, the gap between demand and capacity may degrade the quality of the supports it provides to the most vulnerable people in our communities. The federal government made a commitment to explore broader opportunities to reform the regulatory regime governing charities in its mandate letters. The recent Report of the Consultation Panel on the Political Activities of Charities urges the federal government to “modernize the rules governing the charitable sector through the development of a new legislative framework.” We suggest that the federal government and the sector take that opportunity. This paper reviews the federal charities regulatory regime, and discusses the limitations of this regime as designed and administered today. It summarizes past reform efforts and international lessons, and recommends high-level changes by which the federal government and the sector can begin to build a more responsive regulatory framework. In response to that reality, the charitable sector is pressing for regulatory reform. The political activity audits,2 recently suspended but still fresh in the sector’s mind, supply just one example of where the regulatory regime must modernize if charities are to better serve their constituents. A well-drawn regulatory regime will augment the ability of charities to meet ever-growing expectations. This paper seeks to help the sector and the architects of the federal regulatory regime – developed by the Department of Finance and administered by the Canada Revenue Agency’s Charities Directorate – create a more enabling regulatory environment. In an enabling environment, the government invests in the growth and success of the sector and consults key stakeholders on their priorities and needs. It safeguards public interest, supports the sustainability of charities and nonprofits, while optimizing the policy landscape for innovation and experimentation.”3 This paper outlines how today’s rules sometimes interfere with that vision, and offers high-level recommendations to begin a process of re-alignment. The federal government made a commitment to explore broader opportunities to reform the regulatory regime governing charities in its mandate letters.4 In 2016, it launched the political activities review5 which resulted in the Report of the Consultation Panel on the Political Activities of Charities.6 While it focused on political activities, it urged the federal government to “modernize the rules governing the charitable sector through the development of a new legislative framework.” As the Panel noted, a new framework would permit the federal government and the sector to address long-standing problems, such as the static list of charitable purposes and the tight restrictions on social enterprise. Review the federal charities regulatory regime. Discuss the limitations of the regime as designed and administered today. Summarize past reform efforts and international lessons. Recommend high-level changes by which the federal government and the sector can begin to build a more responsive regulatory framework. This paper is part of Mowat NFP’s Enabling Environment series. The series intends to help the federal government and the sector develop a modern policy framework that strengthens the sector and enables it to improve the quality of life of people in Canada and around the world. Papers in the series aim to help guide discussions and priority-setting between the federal government and the sector.